NASA's Phoenix spacecraft is nearing its destination at Mars, with a scheduled landing date of May 25, 2008. 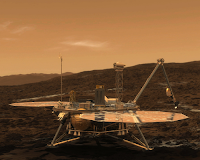 The Phoenix probe will land in Mars' far northern polar region, where it will conduct scientific experiments on the planet's polar ice cap. According to previous investigation, the landing site chosen for the Phoenix spacecraft possesses water ice near or at the surface. Phoenix is equipped to dig, if necessary, to reach such water deposits. After Phoenix has acquired the samples, it will analyze the samples using several on board instruments. By analyzing this data, scientists can learn a great deal about Mars' climatic history. According to a NASA press release, Phoenix has three main goals to accomplish: to study the history of water on Mars, to determine if the Martian arctic soil could support life (including future human life), and to study Martian polar weather. Accomplishing these three goals will give scientists and astronomers a better understanding of the role water plays on both modern and historic Mars. It is possible, that on timescales of 50,000 years, that the climate of Mars changes, and water ice could become liquid water. Phoenix will provide useful insights into this process. To help Phoenix accomplish these goals, it carries with it several important appendages and scientific instruments. The most important of these instruments is its aluminum and titanium robotic arm. Since Phoenix will be a stationary platform, it will not have the capability to rove around for samples. This stationary platform approach is also vulnerable to rocks on the surface, so the landing must go perfectly the first time. Phoenix will use its robotic arm to sample from its surrounding environment. This 7.7 foot long robotic arm will also have a camera attached to it, near its scoop. The camera will assist in collecting soil and ice samples, and provide close-up images of the Martian soil. To analyze the samples retrieved by the robotic arm, Phoenix will use a full array of scientific equipment, including its surface stereo imager, several types of spectrometers, as well as microscopy, electrochemistry, and conductivity analysis equipment. The stereo imager is composed of two cameras, spaced similarly to a human pair of eyes. When the images are combined, a three-dimensional image is created. Think of it as 3-D glasses on Mars. The other instruments will determine the chemical and physical properties of the soil and ice. We'll see in about a week how the landing went. Results should be in around 8 PM EST on May 25, 2008. I’ve got a rather unusual request, not a comment. I am interested in starting a non-profit school on astronomy in northern New Zealand. I am a novice at best ~ I have an idea, not neceassarily the resources and all that is required to go head to head with the big guys! Could somebody put me in contact with someone that could point me in the proper direction, to get me started. Realizing everything starts at the beginning - I got the idea, and I think more will come as I get information on whom to speak with and the feasibility of even doing something like this. Being as that I do not live in or near New Zealand, I'm not familiar with your local situation. However, if you would like to talk to people interested in astronomy, check out the www.cloudynights.com forum. They have an "outreach" section that would probably help you out with your goal. There is probably even a few members on there within reasonable distance to yourself. That is a wonderful write-up. Extremely useful and also in depth. Thank you regarding shelling out great deal energy inside revealing these specific details. Today follow-up Cash Advance All the best. Regarding great write-up. وبمجرد وصول بيكربونات الصوديوم إلى معدة النمل فإنه يتفاعل مع الحمض المتواجد بها، وينتج عن التفاعل غاز، ولأن النمل على ضد الإنسان لا يستطيع التخلص من الغازات المتواجدة داخل جسده، فإنه يهلك في الوضع .